February is often thought of as the month of love, so what better time to bring up kissing! I think many people are unaware of the risks of kissing new born babies, and I think it’s important we highlight those risk’s. Nearly everyone loves to see a newborn baby. They are so cuddly, innocent and bring out a feeling of love and warmth for most people. As a Mother, I remember fondly of the times I was holding my young babies and showing them my love. 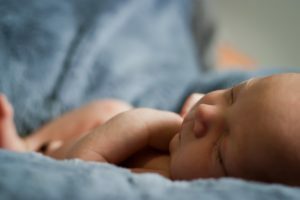 Maybe it was my paediatric nursing background, or maybe my mother bear instincts, but I was always wary about people having clean hands, and how their own health was, prior to letting them touch my child. Babies do not have a strong immune system so things that affect adults could cause significant more harm to a young baby. Whilst a baby can catch this during labour it can also be contracted after birth and one of the main ways is from being kissed by someone with a cold sore. If any of these are noticed please contact the GP/Midwife for advice. The NHS page (link above) provides further symptoms to look for. The World Heath Organisation state oral herpes is a highly contagious infection which is a lifelong condition. Although the person may be asymptomatic (symptom free) you will still carry the virus in your body. It is vital we show our babies we love them and create a bond, so instead of placing a kiss on the mouth, kiss them on the head. You can still embrace them and demonstrate love that way. Other ways to ensure you keep your newborn as healthy as possible is to ensure you wash hands regularly. Make sure you don’t place any dummies in your own mouth before giving to your child. It may also be sensible in the very early stages, to avoid your newborn being around people who have had any diarrhoea or vomiting if at all possible. A New Year: A New PhaseIs Brexit giving you a headache?